Betsy and Peter outside on the porch during a warm winter day. Step into Gold Mountain Manor and be instantly transported back in time. You will easily feel a sense tranquility and know that the stay of your dreams is just beginning as Betsy warmly greets you. 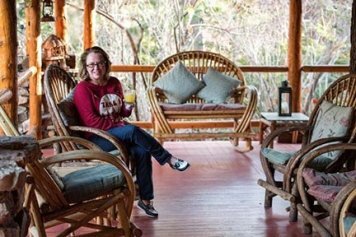 She’s the innkeeper, hostess and owner and will make you feel like family or an old friend from the moment she greets you. You’ll arrive to the sweet aroma of Betsy’s signature home-baked chocolate chip cookies. Don’t forget to refresh yourself with a glass of sweet ice tea or fresh mint lemonade and your vacation has officially started. Want to know anything about a hiking trail? Just ask. Betsy has hiked most every trail in Big Bear. Do you have the urge to kayak? Betsy can steer you to the best areas of beautiful Big Bear Lake. As an experienced kayaker she might just join you on an early morning or full moon paddle. She’ll have you paddling the entire lake before you’re ready for a second helping of cookies. She also has the best tips for biking, boating, fishing or off-roading. Come to the Manor in the winter and learn about the best places to snow shoe, ski, snowboard or to go sledding with the kids, big or little. There’s always a warm fireplace waiting for you back at the Manor. 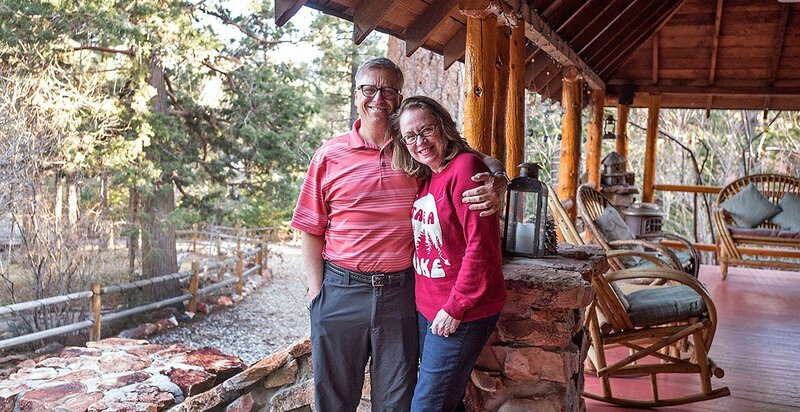 Big Bear is a great place for romance, Big Bear is a great place for romance, to celebrate an anniversary or even for a wedding. Betsy knows how to put the finishing touches on a romantic getaway or a fun-filled weekend wedding celebration. Having coordinated hundreds of wedding at Gold Mountain Manor, you can leave the details to us. Watch a sunrise or sunset and take spectacular photos as you walk just a ½ block up the road into the San Bernardino National Forest. Cathy can also set you up for a romantic picnic near the lake. Just ask! If you are lucky to be here at the right time of year, Betsy will show you the “Owl Tree” so you can see all the owls come out at dusk, swivel their heads as they watch you, and you can also watch the young owls fledge for the first time. Ever been kissed by a wolf? There’s a first time for everything. Have Betsy set up an appointment at Wolf Mountain Sanctuary, to meet the rescued wolves. Intelligent and beautiful, they will find a place in your heart. It’s just 20 minutes away by car. There are just so many things to do. Get a massage. No need to leave your room. Betsy will set up an in-room session. Experience a personal Reiki session in the forest. Enjoy a great dinner at one of Big Bear’s inviting restaurants. Go dancing or hear live jazz –right in the heart of Big Bear. As a foodie herself, Betsy might just prepare one of her own signature dishes for you to try. At breakfast, be prepared to be “wowed” and a little overstuffed. You might want to take that hike in the forest after your meal. 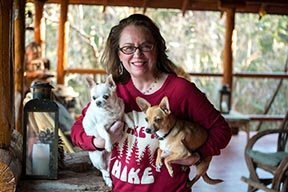 If there are two things Betsy loves more than her guests enjoying outdoors, it’s her two beloved dogs, Pixie and Benny. Sometimes mistaken for chihuahuas, these two are forever her companions. If you need an away-from-home doggie fix, Betsy just might have the dogs to help you out. Benny and Pixie love to snuggle, play ball, hike, snowshoe and fetch. As cute as they are smart, they’ll have you wrapped around their paws in no time. Remember, Betsy and her staff are ready and able to help with anything you may need during your stay. Just ask. Everything is waiting for you at Gold Mountain Manor.